The question is asked, “What is the spiritual meaning of metaphors such as light and day, darkness and light? what aspects of your life could be described as light or as darkness? In other words, Paulien is explaining Paul’s words that the people who are not children of darkness but of the light and of the day are those who read Scripture diligently. Unless a person is open to knowing the Lord Jesus, unless a person is willing to admit his natural condition as a person condemned to eternal punishment unless he believes in the Lord Jesus (John 3:18), unless a person is born again (John 3:3-6), he will not be walking in the light simply by poring over Scripture. Millions of people have assiduously read Scripture but have twisted its meanings because they impose their own analysis onto God’s word instead of allowing God’s word to define and inform them. William Miller, for example, spent hours concocting his 15 proofs that Jesus would come in October of 1844, yet he was completely wrong. He used Scripture to arrive at those conclusions…but he misused Scripture. Unless we receive the verdict of Scripture on our own lives and submit ourselves to God and His word, repenting of our sin and receiving the Lord Jesus’ sacrifice for our sin by faith in Him, we will not understand Scripture, and we will not be walking in the light. Scripture does not have the power to save us or to make us righteous. It only reveals the truth. Unless we are receptive to that truth and submit to it, it will not change us. We walk in the light only when we receive the Lord Jesus. He IS the Light. Scripture then changes us and teaches us what is real and true—but until we submit to the One in whom there is no darkness at all, we will simply not be in the light. 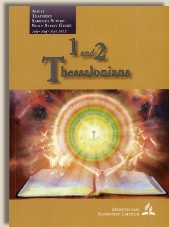 Paul’s words to the Thessalonians were words of comfort because they were walking in the light. They knew Jesus and were born again. They did not have to fear being surprised by the day of the Lord because they knew the Lord. Any moment He decided to return would be a moment of joy for the born again! The word of God truly is His personal revelation of truth and of His will to us. But it will not change us or cause us to be children of the day unless we submit to the One who wrote it. We must hold the Bible over our own minds and must not put our own minds over the Bible. It must tell us the truth about ourselves, and we must receive what it say about Jesus. If we do not place our faith in Jesus and become born again, we are not Christians. If we are not Christians, God’s word will not make sense to us. Children of light are not simply people who read Scripture. Jesus is the Light of men. Unless we receive Him and are born again, Scripture will not make sense to us. God’s word tells us the truth about ourselves and about Jesus. We must be willing to submit to that truth in God’s word, repent, and believe in Him whom the Father sent. Unless we are born again, Scripture will not make sense. We are only children of Light when we receive the One who is Light.